If you look at the type of emails you receive from clients you will probably find that common issues or queries arise. This should be the starting point for analysing your content. There may be problems such as lack of clarity and purpose on your web pages or perhaps, an absence of cohesive messaging or streamlined branding. When you look at each web page you should be able to identify clearly, the useful information that a client is going to walk away with. The page should also be well organised and any on-page graphics should enhance your brand message. A lot of people create and write web pages because those are the pages they’re supposed to have. However, over time, you might find that these pages no longer align with your brand or enhance your business. This can be fixed very simply. Once you have established your business goals, write an objective for each main page you’re displaying. With this goal in mind, go back through each page and edit content, removing any unnecessary information or adding in essential material that’s been missed out. Most people make the mistake of creating web pages with the mindset; “if my customer wants to find x, they can find it here”. However rather than just including information considered valuable to the reader, try to think of each web page as a journey. You want to guide the customer through your website, and through your content. So instead utilise the mentality of “here my customer can find information about x, y and z”. We all like choices, but if you want someone to do something, it’s better just to tell them. For example, if you want people to book you then give them one place to go, not various options. This one place should include valuable information. If your customer clicks on this page and doesn’t get any useful feedback then you run the risk of losing potential clients. It’s best to just cut out the middle man and get right to the point. Each web page on your site should include a call-to-action. Once people have engaged with the content on your page, what should they do? Call-to-actions should be different from page to page and they don’t always have to be “subscribe”, “sign up” or “contact me”. Every image on your page should align with your overall design and add something to the content. Find a style that you not only like, but also enhances the content on each page. 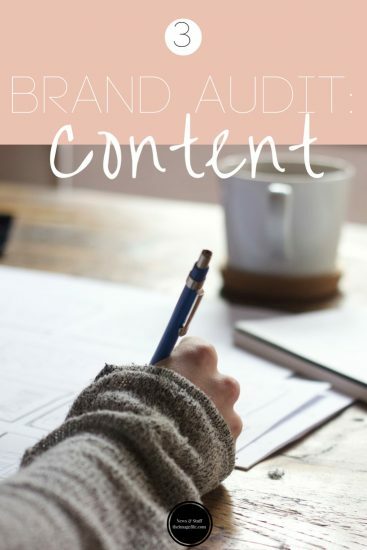 If you haven’t already, then take a look at the other parts of this brand audit including; why a brand audit is important, how to set achievable business goals and how to audit your services. Create a mind map or list with a goal for each web page. This will make it easier to see where you’re heading with each page and what should be included or removed. Determine your call-to-actions. For each page, ask yourself what do you want your client to do next? Where should they go? What should they be looking at? Make sure that this message is clear and in an obvious place. Assess Visually. Do your page images align with your overall style, branding and message? Do the images flow and look united from page to page?